Broadly speaking, the natural historian wants a microscope for one of two tasks: to make small things bigger or to make invisible things visible. There is not really a sharp dividing line between these two categories, as the illustrations of Cladophora filaments in “Summertime blues …” show. 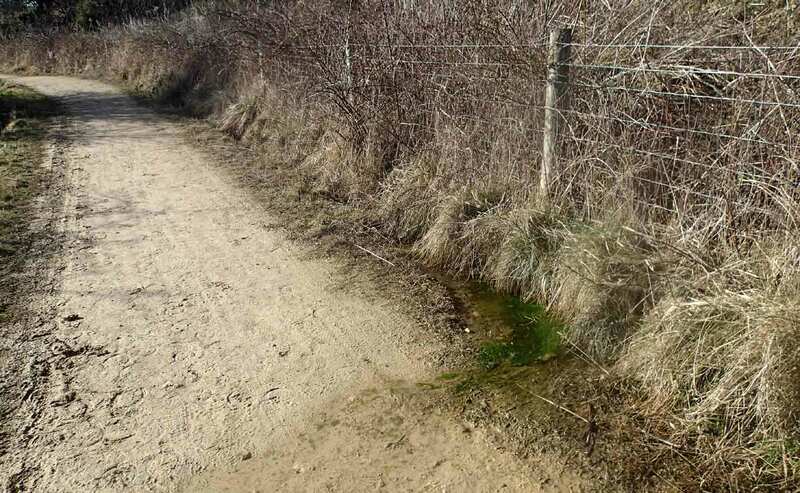 You might start out looking at a handful of green slime pulled from your garden pond, but then you might see smaller algae growing on those filaments that you want to examine too. The good news is that you should be able to get hold of a reasonable microscope with the capacity to magnify up to 400 times for about the same outlay as a digital SLR camera. That should let you see all but the smallest algae. If you are sure that your interests lie mainly in “making small things bigger” then you should consider a low power dissecting microscope (these are probably the best way of introducing children to microscopy, as there is a smooth transition between the tangible but small object that has piqued their interest and the larger, more detailed image that they see when they peer through the microscope’s eyepieces). However, even though a basic microscope need not cost a fortune, good microscopes are expensive so my advice to a beginner is to search out a rerfurbished second hand microscope. In north east England, I can recommend JB Microscopes but Google should help you find dealers elsewhere in the country. A reasonably local supplier is necessary because you should really try out a microscope before you buy. There are reputable mail order suppliers (e.g. Brunel Microscopes) but I would not want to spend a large sum on a piece of equipment that I had not had a chance to use first. 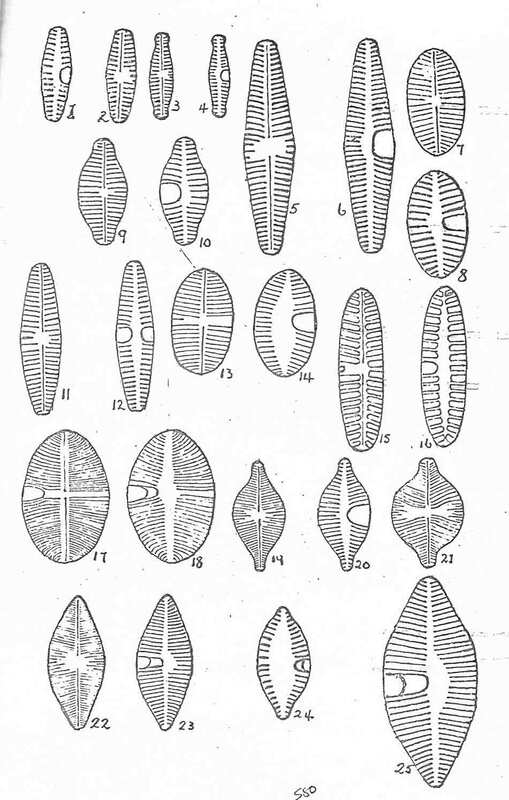 A colony of the diatom Meridion circulare. The image at the top of the post shows desmids from the genus Micrasterias. Both photographs by Chris Carter. If you are on a limited budget, I suggest you go for a good basic microscope with the option to fit a camera at a later stage. It is possible to take a reasonable photograph by pointing a digital camera (or even a smartphone) down the microscope’s eyepiece and it is better to put up with the shortcomings of these images than to sacrifice the quality of the microscope itself. Once you have your microscope, you will also need slides, coverslips, forceps, some plastic Pasteur pipettes, a couple of needles, a scalpel and some collecting tubes. You can buy all of these from Brunel Microscopes and NHBS, both of whom cater for both the amateur and professional markets. They also sell boxes of prepared slides, which are a good way to get some experience at using a microscope. The microscopic world generally lacks the type of user-friendly well-illustrated identification guides that help us identify wild flowers, birds, butterflies and so on. Most books are aimed at the academic market and are, consequently, expensive. 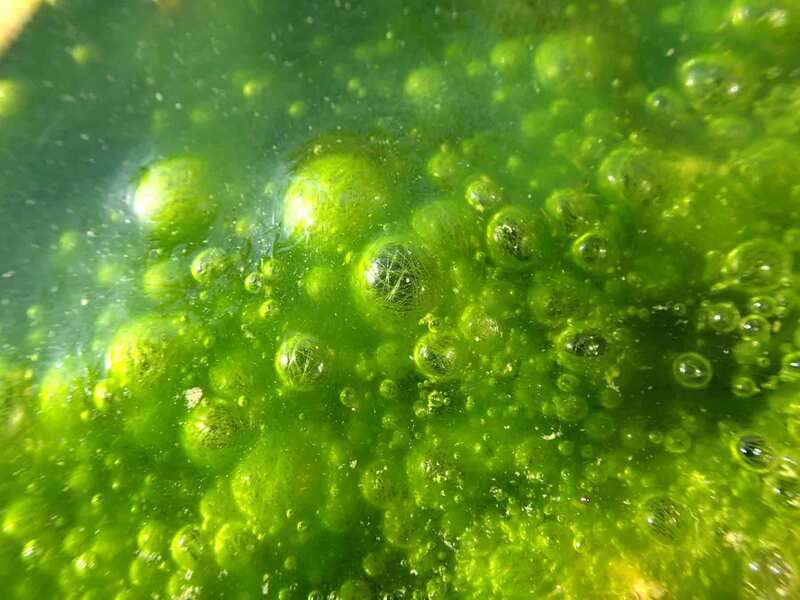 If you want to get started with freshwater algae, one useful resource is this guide to the larger algae found in rivers: RAPPER_manual_version1.7_May2016. It was produced to accompany a method for rapid assessment of streams and rivers and, as the journey towards formal publication has stalled, I am happy to make it available here. Hydrodictyon reticulatum, the water-net, photographed by Chris Carter. 500 mm (micrometres) is half a millimetre. 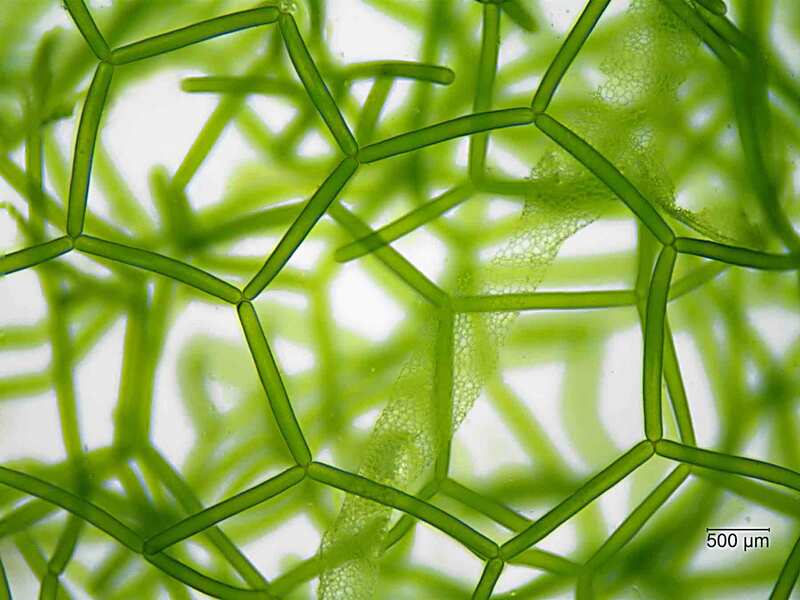 Useful websites include AlgaeVision and the Diatom Flora of Britain and Ireland. As most freshwater algal genera are found throughout the world, Diatoms of North America is also a useful resource. 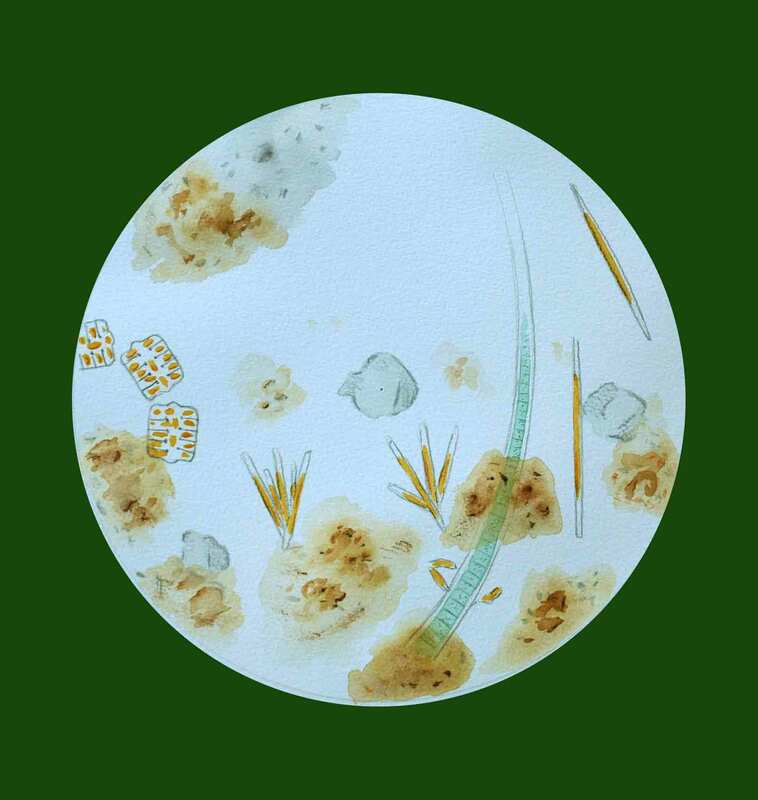 The Freshwater Biological Association have affordable booklets on the identification of desmids and diatoms and there is an AIDGAP key, too, for freshwater diatoms. The latter is badly in need of updating but, people assure me, is still useful for beginners. There are plenty of other online resources, but l would recommend visiting the website of the Quekett Microscopical Club, a long-established group of enthusiasts whose interests span the whole realm of natural history and optics. www.microscopy-uk.org.uk is also worth a visit. Both websites will help you as you start your explorations of the hidden worlds of nature. Do we see through a microscope? I would have considered this to be a question that barely needs an answer. That, however, was before I read an essay by philosopher Ian Hacking who brings the spirit of logical positivism to the question. When we look through a microscope we see objects that are not “… physical things in a literal sense,”, he writes, “but merely by courtesy of language and pictorial imagination.” Confused? Read on. First of all, “seeing” is not the same as “looking”. “Seeing” implies a higher level activity than mere “looking”. Both involve the reaction of light on the retina, leading to stimulation of the optical nerve. However, what we see when we look down a microscope differs from what we see when we look at a view out of a window in two important ways. The first is that most of the time our eyes are analysing reflected light, whereas the microscopist mostly (though not always) is looking at transmitted light, light that has passed through the object we are looking at. The tones we see are a consequence of variations in the proportions of light that are transmitted or absorbed rather than in the proportions that are reflected or absorbed. The second difference is that a consequence of magnification using an optical microscope is a very shallow depth of field (i.e. the space within which objects are in acceptable focus). The picture below shows the view down my microscope as I was examining the specimens that I wrote about in my previous post. In practice, I never actually “saw” this image, and I certainly could not have photographed it, due to the limitations of depth of field. In practice, I was constantly adjusting the focus with my right hand, whilst drawing with my left. This is a point that Hacking makes: you have to learn to “see” through a microscope. As children we learn to judge distance by correlating visual information with tactile experiences, so microscopists learn to infer three dimensions in their worlds by gentle manipulation of the fine focus mechanism on their microscopes. “Seeing”, in other words, is far more than just the consequence of light hitting the retina. River Ehen, near the outflow from Ennerdale Water, December 2015. Drawn at x400 magnification. See images in previous post for indications of scale. More broadly, we could argue that “seeing” in the microscopic world requires interventions. The lenses in our microscopes are one type of intervention, of course and without these we would not be able to see tiny objects with clarity. But this is just the start: we often use stains to adjust the optical properties of certain parts of cells, making it both easier to see these and, in many cases, to infer their composition (iodine binding to starch is a good example). These stains are often highly toxic so one unwelcome “intervention” is that we necessarily study dead or dying tissues. 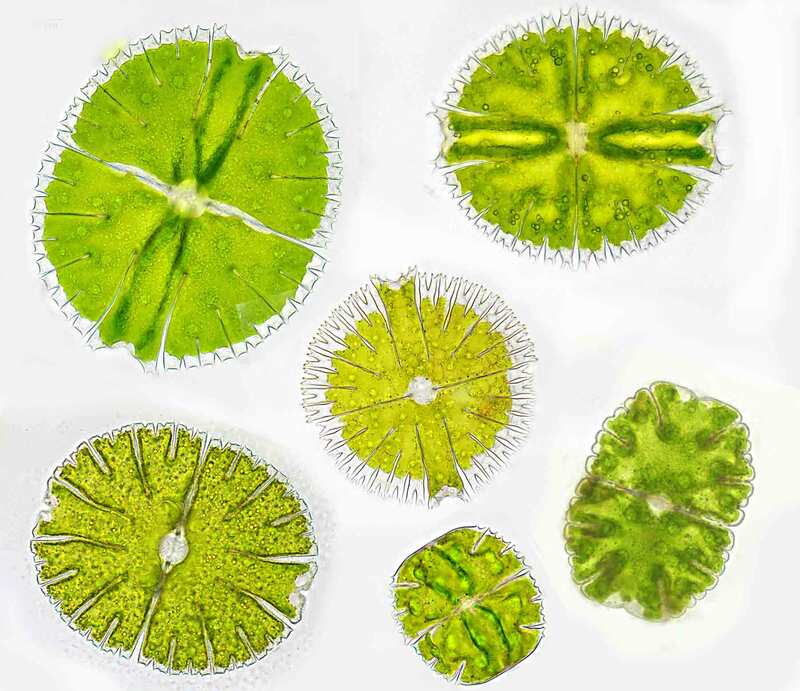 The study of diatoms depends upon high resolution mountants, which make the task of viewing structural details of objects that are, essentially, microsocopic lumps of glass mounted between a glass slide and a glass cover slip much easier. This follows a stage in which the cellular contents are dissolved away by the action of strong oxidising agents. So routine is this stage that many diatomists are in danger of forgetting that the empty glass shell is not really the reality that they seek. We could argue that microscopic observations approach truth only when they can be validated by an independent means. At low magnifications, the difference between the raw and magnified images are small and individuals can easily validate what they see through a lens. I know that there are words on a page of writing because I can see them crisply through my reading glasses but I could also, if necessary, hand the page to my son who will be able to confirm that the fuzzy blur that my unaided eyes discern is, indeed, writing. However, there is a threshold in magnification beyond which this form of validation will not work. We rely on a network of theoretical “proofs” to confirm the truth in a microscopic image. At one end of the scale this may involve a continuum of consistent observations from the hand lens to medium or high power optical microscope. At the other end of the scale, it may involve a completely different approach to visualisation (the electron microscope, for example) to corroborate an observation. During my postgraduate days, a fellow student defined the cellular organelles he saw in his electron micrographs as “reproducible artefacts”. His flippancy, in fact, contains a deep truth: we make our observations on highly manipulated specimens and need to be rigorous in our efforts to confirm their validity. Hacking’s conclusion was that we see with a microscope, but it is naïve to suggest that we see through a microscope. We may look through a microscope but the images make sense only because of interactions that go beyond patterns of light hitting the retina. “Seeing”, in other words, is a higher-level process that involves interactions with the brain and with the specimen itself. Hacking calls on a lot of high power philosophy to make his point; all we need to do is to take care before equating the images we create with the truth. River Wear, Wolsingham: four views down the microscope: top left: January 2009; top right: March 2009; bottom left: June 2009; bottom right: September 2009. Ian Hacking (1981). Do we see through a microscope? Pacific Philosophical Quarterly 62: 305-322. I wondered, as I re-read the previous post, what my late mentor and friend John Carter would have called the diatom I was writing about. 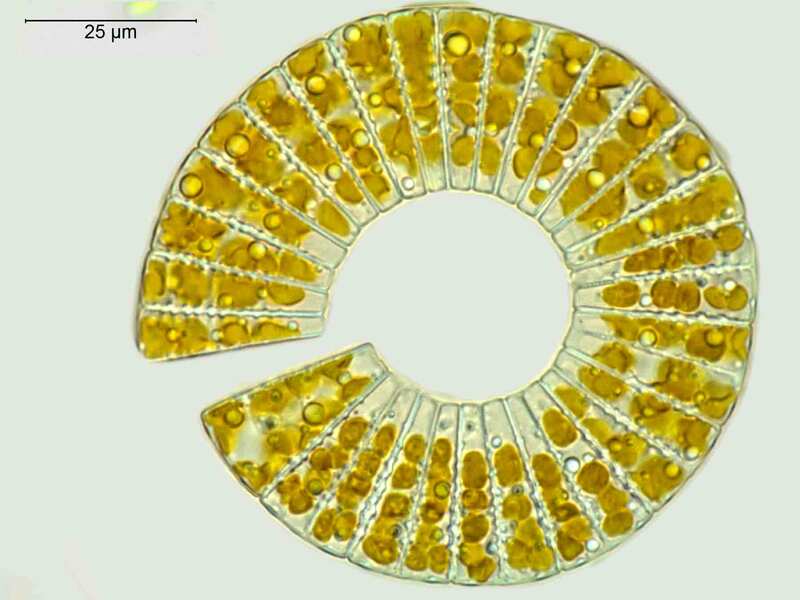 When I first started looking seriously at diatoms in the early 1990s, there was no-one in my laboratory in Durham with any experience from whom I could learn, and Brian Whitton suggested I went up to visit John at his home near Hawick, in the Scottish Borders. I rung to arrange a date and, a couple of weeks later, made the two hour drive up through Northumberland and across the border to his house in the small village of Denholm. Stepping into John’s study was like stepping back in time fifty years: it was dark and dusty, with piles of books and file boxes lining the walls and stacked on tables, along with boxes of microscope slides. In the fireplace there was some of the equipment that he used to digest his diatom samples – apparatus that really belonged in a laboratory fume cupboard. And, on a narrow desk against one wall, an old brass microscope equipped with a tilting mirror rather than its own light source. 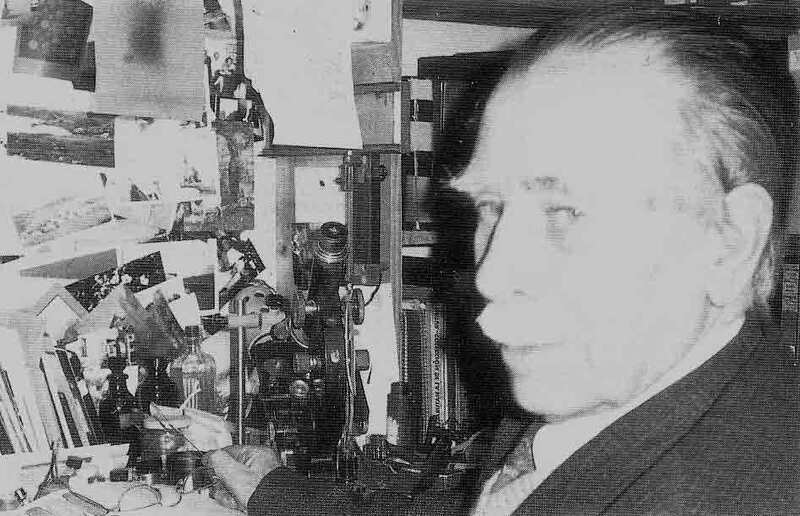 John Carter in his study at Denholm, in Scotland. An uncredited photograph from his obituary in Diatom Research. We spent the day in this study, John peering down his microscope and calling out the names of the diatoms he saw along with a commentary on the diatomists he had known (Hustedt, I remember him telling me, was a member of the Nazi party, which made it difficult for him to re-integrate with the scientific community after the war). I perched on a chair beside him taking notes and occasionally squinting down the microscope to see for myself what he was describing. I often, too, got a pithy assessment of the state of the slides that I had brought with me. After a couple of hours of this, we would be summoned by his wife into the dining room for a hearty casserole, and while we ate they would quiz me about my children and talk about their years in the Borders. Later, back in Durham, I would go back through the slides and try to reconcile my notes with what I could see under the laboratory’s much more modern microscope, ever marvelling at just how much detail John had been able to see with his old equipment. 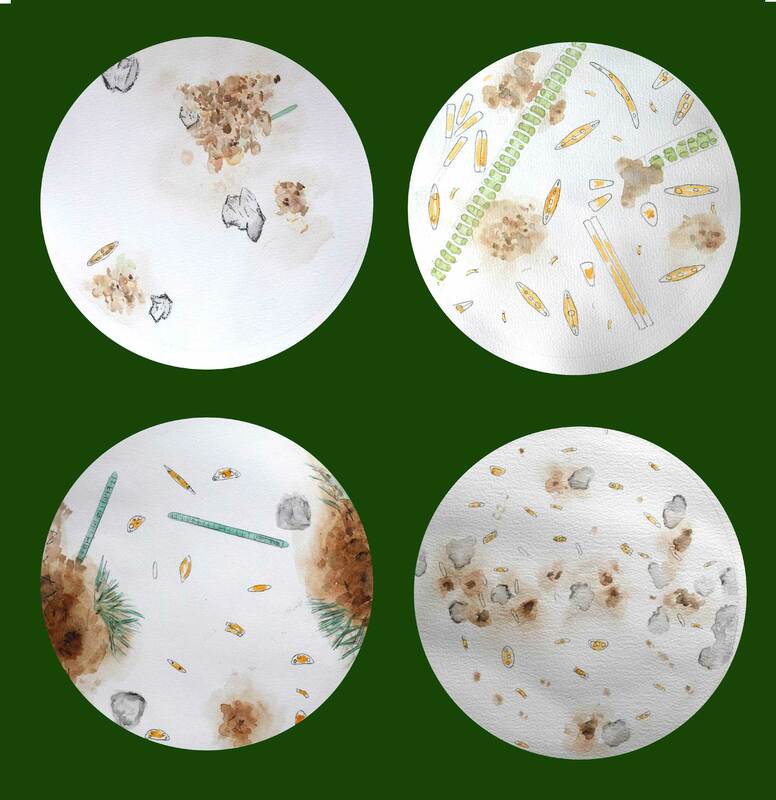 It was a steep learning curve but, after half a dozen visits to John, it all began to make sense, and I gradually gained the confidence I needed to identify diatoms on my own. Not long after that we had a telephone call in the laboratory to say that John Carter had died. I felt that a door onto an older, more civilised, way of doing science had closed.